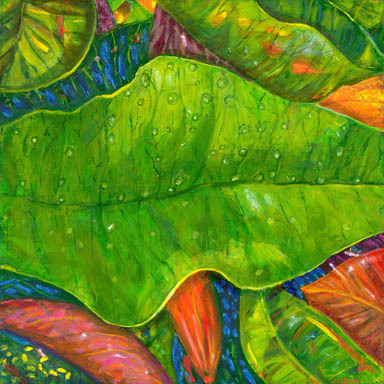 Large Art Prints of Tropical Rainforest Plants Display Colorful Leaf Patterns. 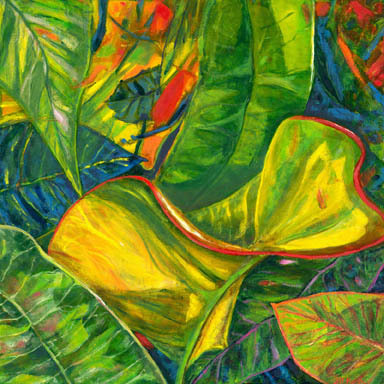 Jill Booth has developed a series of large art prints from original paintings of the colorful foliage of tropical rainforest plants as well as from Great Barrier Reef subjects. 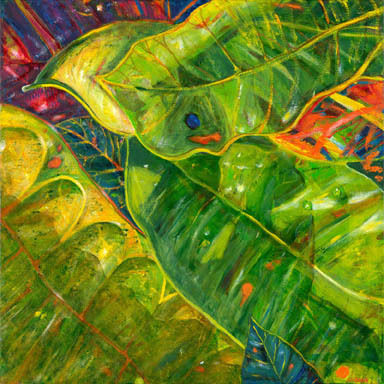 She says: “Tropical rainforest plants abound in my garden and I am amazed at the exciting leaf patterns and the vibrancy of their colorful foliage. It is interesting, but understandable, that the plants that produce such brilliantly coloured rainforest leaves have rather insignificant flowers. The eye-catching tropical rain forest plants that I most admire for their beauty and tenacity in the face of adversity (such survival skills!) are the croton family. 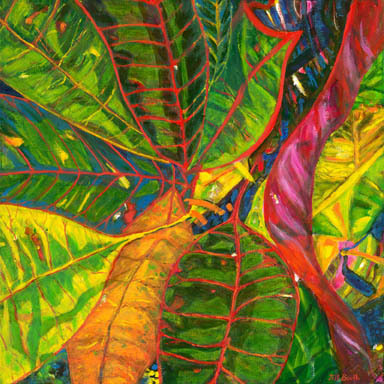 Their waxy and brightly coloured leaves make such an attractive display, their wild color leaping out from a background of darker green bushes”. “I started this series of six paintings with the thought that they could be made into large art prints, but the original oil paintings are only 45 centimetres square. I spread the canvases out on my high printing table and worked on them as a group, turning them this way and that so that marks would line up, whichever way they were presented. The overall composition was developed first using acrylic paints, as these dry quickly. 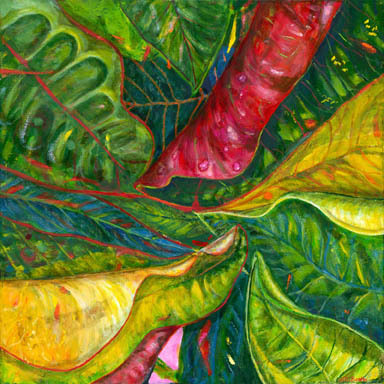 Then I started with oil paints, building up colours and shapes in a way that seemed interesting and which imparted observations about characteristics of the plants and the amazing leaf patterns that Nature has devised. I kept working on the group of paintings until the basic shapes and forms were complete, then developed each one separately, applying one colour to each, letting that dry then using the next colour. The whole job took me about four or five weeks. Once the paintings were thoroughly dry I took them to Lee Middleton from High Scan in Cairns to be scanned and printed. Lee uses only quality inks, substrate and varnish”. Here they are! Choose your favourites and enjoy your tropical decorating! If you purchase two or more of these large art prints at the same time, a discount of 10% will apply. Prints don't need to be large, of course - see the choice of sizes, below. 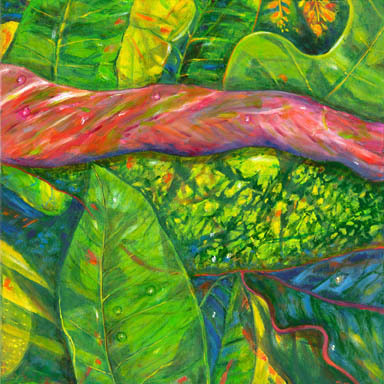 Giclee art prints (Crotons) on canvas and on paper. This limited edition is restricted to 50 of each size on canvas and paper (400 prints in total). A discount of 10% applies to multiple purchases. Tiny prints (unlimited) - 100mm x 100mm - on paper only are available for $A22 each + packing and postage. YOUR GICLEE PRINTS will be sent to you in a mailing tube via Australia Post. If you wish to purchase any of these giclee paintings stretched or framed please contact me for a quote. Otherwise just take your unframed work to your local framer and choose the style that best suits your decor. ENJOY your new artwork. Perhaps you will start an inexpensive collection? These fine art prints on canvas or paper are by Jill Booth and may be purchased either on 310 gsm German etching watercolour paper or on quality cotton canvas. They are available unframed and unstretched and will be sent per Australia Post in a mailing tube. 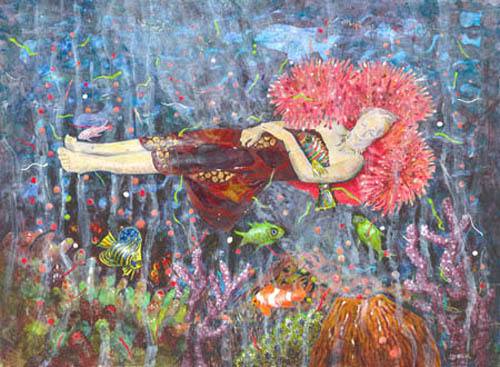 'Coral Dreaming' resulted from an excursion by a group of artists to a small Great Barrier Reef Australia coral cay off Port Douglas in Far North Queensland, where they had gone to witness the annual coral spawning. Jill takes up the story, "The full moon, which seems to trigger this spontaneous event, shone magically from a vast sky as we set out across the lagoon in our dinghy, hands trailing through the now strangely phosphorescent water. Swimming through pulsating coloured reef fish, wriggling worms and popping coral, the smell of sulphur strong in the air, waterproof torches revealing the frantic activity, the more daring artists headed in the darkness for the lighthouse. Here Christine rests, dreaming, on an outcrop of coral while fish, worms and coral polyps continue their frenetic dance around her. The amazing experience was one to remember - and to dream about! Packaging and nominal postage please add $17. Limited edition of 50 each size on canvas and on paper : Please see prices above. Framed fine art prints: Purchase of unframed prints is encouraged for two reasons. 1. You are free to choose your own size and style of matt, frame or stretcher. However, we are here to help so if you would like an obligation-free quote for framing please let me know via our contact form. The artwork pictured above explores collage ideas and could be defined as mixed media collage art, now developed further into inexpensive high quality fine art prints on canvas or paper - another dimension again.